This year sees the 125th anniversary of the Camanachd Association and a series of events has been planned to mark the occasion. The anniversary falls on October 10 when, in 1893, in the Victoria Hall in Kingussie, representatives of various shinty clubs throughout the country met ‘for the purpose of forming a Camanachd Association’. Among the preparations was a competition to design a logo that saw hundreds of entries and which was won by primary seven pupil John Robert Chisholm of Leverhulme Memorial School on Harris. There is also an anniversary book – Surviving and Thriving by Steven MacKenzie – reflecting on the 25 years since the centenary. An anniversary art project, entitled Throw Up 2018, is an innovative collaboration linking visual arts and shinty. Highland Print Studio has paired four artists with four clubs and tasked them with creating work inspired by their experience. The work will form a touring exhibition that will be on show at the Tulloch Homes Camanachd Cup Final 2018. Among the forthcoming anniversary events is a conference – Surviving and Thriving – in partnership with the Highland Folk Museum on October 10. Shinty’s Heroes, in the Badenoch Centre, Kingussie, on October 10 will be the final performance of the much-acclaimed musical audio-visual concert commemorating the impact of the First World War on shinty communities, presented by Hugh Dan MacLennan and Gary Innes. Before that, however, there will be a Big Day of Shinty at the Glasgow 2018 European Championships, which will have a shinty-themed ceilidh, come and try events and more at the Greenfield Playing Fields in Glasgow on Sunday August 5. ‘Caman’ Back to Shinty is a week-long celebration of the sport from October 6-13. 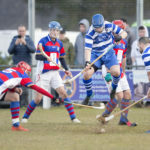 A highlight will be the Tulloch Homes Camanachd Cup, the most coveted competition in shinty, which will take place on Saturday September 15 at Mossfield, Oban. Main sponsor Marine Harvest’s Valerie Fraser Women’s Camanachd Cup is the highlight of the women’s calendar and sees the cup played for the 16th time at the Dell, Kingussie on Saturday September 1. A new feature will be the inaugural England v Alba representative match over two legs. The first takes place at the Dell, Kingussie, on July 28 with a 7pm throw-up. The second leg will take place at the London Shinty Festival on October 6. 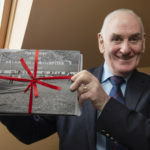 Keith Loades, president of the Camanachd Association, said: ‘The 125th anniversary of the formation of the Camanachd Association offers the current board and everyone enjoying the sport of shinty a significant opportunity to applaud and appreciate the foresight and organisational prowess of all those responsible for putting in place an association which has stood the test of time. John Chisholm, designer of the 125th anniversary logo, said: ‘I wanted the logo to be engaging, bright, colourful and very active, just like a shinty game. The human forms have no detail so they represent any race, gender or age.